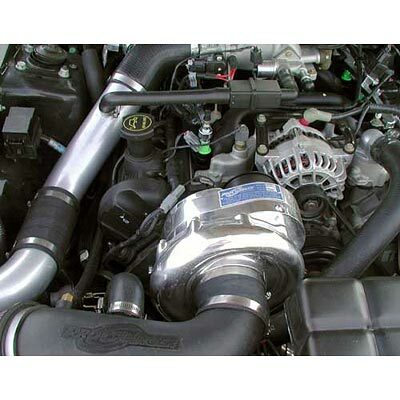 Supercharger systems for the 4.6L Mustang GT are one of the best "bang for the buck" power adders. Installation can be done in a weekend with simple hand tools. This system comes with either a 2 or 3 core intercooler, with boost levels from 8-10 psi on complete systems. Boost levels on Tuner systems could be as high as 15 psi or more with custom tuning. Complete systems add 55-60% more horsepower over stock at 8-10 psi, spelling out power levels of 400+ HP. The dyno graph below is for a House of Boost installed and tuned Stage 2 Intercooled system at 8 psi on a stock 2003 Mustang GT. Stock horsepower and torque are indicated by blue lines, ProCharged horsepower and torque are indicated in red.